This bluebird nesting box is a great way to get started making birdhouses. You do not need to mitre any edges and the entire project can be completed using one 6 foot length of 1″ x 6″ lumber. Since only simple materials and tools are required, this birdhouse is also a wonderful project for Scouts, youth groups, and beginning woodworking classes. Cut the wood to the dimensions in diagram A. All of the pieces can be cut from one 6′ length of 1″ x 6″ lumber. 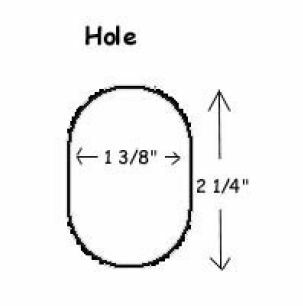 Cut the front entrance hole as in diagram B. this is an oval shaped hole that is 1 3/8″ wide and 2 1/4″ long. To begin cutting this hole, mark the dimensions on the front. Then drill one 1 3/8″ circle at the top. Repeat at the bottom of the hole, overlapping the drilled holes. Drill two small holes near the top of each side for ventilation. Drill four small holes on the bottom for drainage. Using finishing nails or wood screws, secure one of the sides to the bottom. Then secure the front and back to the same side. Slip the 2nd side into place. Secure using two nails, one near the top on each side. These nails will be pivots so make sure they are across from each other. Screw the eye screw near the bottom of the 2nd side. This screw is to make it easier for you to open the box occasionally to monitor it as well as to clean it out at the end of the season. Drill a small hole through the front near the bottom into the 2nd side. Push a bent nail (I have a few by this point!) into the hole to keep the 2nd side closed. If you wish, use a small wood screw instead of the nail. 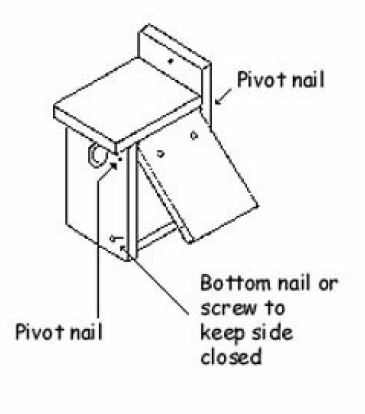 Nail or screw the roof to the nest box.